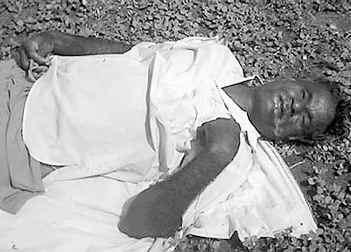 Friday 18 June 2004, by SRIDHAR*V.
DEATH stalks the countryside. More than 80 suicides by peasants have been reported between May 18 and 29. Details about the suicides, gathered from across the State by reporters of the Telugu daily Prajashakti, provide a chilling account of the widespread distress among the peasantry. A cross section of people told Frontline - academics, peasants and representatives of peasant organisations, politicians and social workers - that the spate of suicides in a short span of about two weeks is unprecedented in the history of Andhra Pradesh. The State enjoys the dubious distinction of accounting for three out of every four suicides by farmers reported in the country in recent years, according to Chief Minister Y.S. Rajasekhara Reddy. Suicides by farmers have been reported from every part of the State, including one by a woman in the Chief Minister’s constituency of Pulivendla in Cuddapah district. Although most of the suicides have been reported from the dry parts of the State, a number of them have occurred in Prakasam, West Godavari and Krishna districts, which are considered better irrigated. Clearly, the distress is not confined to peasants cultivating a particular crop. Those growing chillies, groundnut, pulses, cotton, vegetables and even paddy are among those who have taken the extreme step. 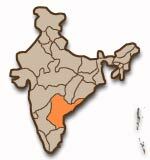 Anantapur district is possibly best designated as the "suicide capital" of India. According to the Anantapur district secretary of the Andhra Pradesh Rythu Sangam, Vishweshwar Reddy, more than 450 peasants have committed suicide since 2000. The district has been hit by a series of droughts in recent years. But that is only to be expected since it generally records the second lowest rainfall in the country (next to Jaisalmer district in Rajasthan). Groundnut is grown in 90 per cent of the cultivable land in the district. The small and marginal peasant incurs a production expenditure of about Rs.3,000 to Rs.4,000 an acre, but has to bear the uncertainty of crop failure without any assistance from the state. Most farmers in Anantapur grow only one crop, which means that the fields are fallow for 8 to 9 months a year. Less than 10 per cent of the cultivated area is irrigated. Vishweshwar Reddy points out that the ten-fold increase in the import of edible oils has meant lower prices for the peasant. Even land prices have dropped dramatically in the past few years. Land in Anantapur, which used to command a price of Rs.40,000 to - Rs.50,000 an acre five years ago, now goes for Rs.10,000. Peasants in distress have sold all that they had - cattle, houses and even their land. Many have migrated in the hope of escaping extreme distress. According to D. Narasimha Reddy, Dean, School of Social Sciences, University of Hyderabad, the life of the small and marginal peasant has become uncertain and risky. Crops are themselves uncertain because of the widespread shortage of water. Peasants, desperate to get water, undertake even more risk by investing in the risk-laden business of digging borewells. According to a Prajashakti report, a small peasant in Mehboobnagar district recently dug 10 borewells without success and took his own life after the 11th well also turned dry. Narasimha Reddy points out that the lack of state investment in irrigation has forced the peasant to bear a greater burden of risk. Even if the crop yields a reasonable return, the peasant faces risks in marketing the produce. This explains why farmers growing a range of crops have committed suicide. Narasimha Reddy said that though input costs have been increasing in the last few years, the price that the peasant is able to command for his produce fluctuates. This is largely on account of the failure of the government to intervene in agricultural markets to stabilise them. Even rich farmers are able to get only 20 per cent of their credit requirements from institutional sources. Obviously, small and marginal peasants do not enjoy even this cushion of lower interest rates. According to the Prajashakti survey, most of the peasants who committed suicide in recent weeks took loans from private moneylenders, pesticide and fertilizer dealers and local "finance companies". These loans carry a heavy price tag. Interest rates generally range from 36 to 60 per cent and may, according to some sources, even go up to a whopping 120 per cent. Narasimha Reddy said that the peasant is often humiliated severely in public by the lenders. Cattle is snatched from the peasants and their houses are attached. Vishweshwar Reddy told Frontline that the Telugu Desam Party government arrested thousands of peasants in Anantapur district when they failed to pay their power dues. "Instead of providing relief to the peasant, the TDP government appointed Special Circle Inspectors in the police department to conduct raids on the houses of peasants who were unable to pay their power dues," he said. He also said that the government collected Rs.120 crores as fines from farmers for their failure to pay their dues in time. WHAT explains this sudden surge in suicides by the peasantry, even after the new government, which promised to improve the lot of the peasant, assumed office? Soon after assuming office, Rajasekhara Reddy announced a relief package to the families of farmers who had committed suicide - Rs.1 lakh to repay the debts and Rs.50,000 as relief. Cynics, who hate the notion of "relief measures", were quick to point out that the spate of suicides in the State was because of this package. However, B.V. Raghavalu, secretary of the Andhra Pradesh unit of the Communist Party of India (Marxist), has an explanation for the phenomenon. He points out that the moneylenders refrained from pressuring the peasants as long as the election process was on. The Rythu Sangam also observed that in Anantapur and Mehboobnagar districts, for instance, the moneylenders feared that the new government, under popular pressure, would cancel the loans due to them from the peasants. There appear two distinct issues in the recent suicides. First, it is obvious that relief must be provided to the affected families. The other set of issues relates to the medium and long-term measures that the government must undertake in order to prevent such deaths from happening. Raghavalu said that the government must separate the two issues clearly. He said while it was important for the government to provide reassurance to the peasant by conducting public campaigns, such measures alone were not enough. He demands that the government "immediately declare a one-year moratorium on debt repayments by farmers. Only if this happens will the moneylenders stop harassing the peasants. Once this is done, the government can devise ways and means for farmers to repay their loans. It can evolve different sets of solutions for various classes of borrowers. The poorest peasants may require a complete waiver of dues, others may be able to do with a debt relief package of staggered repayments of their dues". Raghavalu believes that the panchayats, by virtue of being the nearest available institutional mechanism in the life of the peasantry, can be involved in tackling the problem. Panchayats can organise psychological support to debt-burdened peasants by encouraging them to confide in the panchayat members and seek its protection when they are harassed by moneylenders. Moreover, any debt-relief package announced by the government can be implemented by the panchayat. Although an immediate moratorium on repayments by the peasantry would appear to be a rational response, Rajasekhara Reddy has ruled out any such move. Instead, he flagged off a rally of film and television personalities and sportspersons in Hyderabad who urged farmers not to take their lives. Pic 1: PHOTOGRAPH COURTESY: PRAJASHAKTI; Chinna Subba Reddy, 58, from Lakshmipet village in Cuddapah district, committed suicide on the night of May 28 after his last four attempts to raise a crop (mainly sunflower) on his 2.6 acres failed. 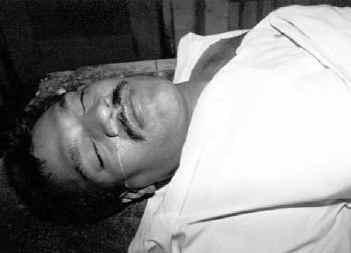 At the time of his death, he owed Rs.1.6 lakhs to moneylenders. Pic 2: PHOTOGRAPH COURTESY: PRAJASHAKTI ; Prema Kumar, 37, a tenant farmer from Tambepally in Cuddapah district, committed suicide by consuming pesticides on May 21 after having suffered losses owing to the crash of tomato prices. He had borrowed Rs.2 lakhs from private lenders and a cooperative bank to raise tomatoes on the 5 acres he had leased.